We will be watching the YouTube video "Making the Most of Your Life" by Lama Yeshe. 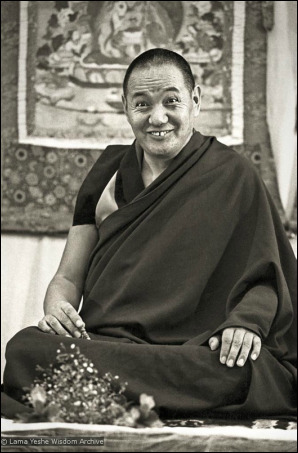 In Lama Yeshe's and Lama Zopa Rinpoche's first trip to Europe they offered a weekend seminar based on their famous month-long Kopan meditation courses. Preceded by Lama Yeshe's lecture on meditation at Kensington Town Hall, these teachings at Royal Holloway College, Surrey, encompass the entire Buddhist path to enlightenment. A three disc DVD set "Freedom Through Understanding" can be obtained through Lama Yeshe Wisdom Archive. The teachings on this DVD set can be found in the book also titled Freedom Through Understanding. ​"Buddhism isn't some fanatical religious trip. It's a philosophical way of living life. And also, to study Buddhism you don't need to believe in something extreme. It's a matter of investigating, examining and experimenting on yourself. It's not just belief. Without understanding, belief can be very dangerous. So what Lord Buddha emphasized was that understanding is the path to liberation, knowledge is the path to liberation."